With more than 15,000 flight hours as captain on the Boeing 737 and the new Boeing 787, Captain Pat BOONE is launching a brand new system quiz app for these airplanes. The Question Bank mobile app comes with 1,000 technical questions covering all FCOM systems, as well as FCTM, QRH, Performance and the Exterior Inspection. Simply set-up your quiz profile in accordance with your company fleet (e.g. our fleet are B737-700 with winglets and carbon brakes) and the app will only display questions that meet the profile. 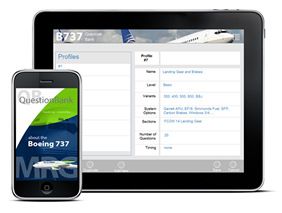 The Question Bank app is available for Boeing 737 (Classic, NG and Max), Boeing 787 and the Embraer E-170/190 series.